Beautiful card! Love that DP. So pretty. 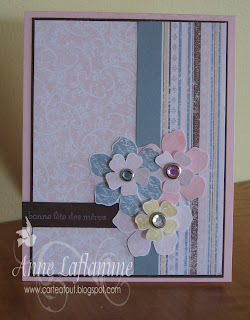 That is a gorgeous card, wish I knew French! (Tres belle???). Love the DSP and the flowers! Anne, this is beautiful! I love the flowers and the amazing papers - gorgeous!!! Oh Wow! Moi ce que j'aime beaucoup de cette carte, ce sont les fleurs! Tu as pris le temps de les découper et c'est vraiment magnifiques! Tu es la top !! !